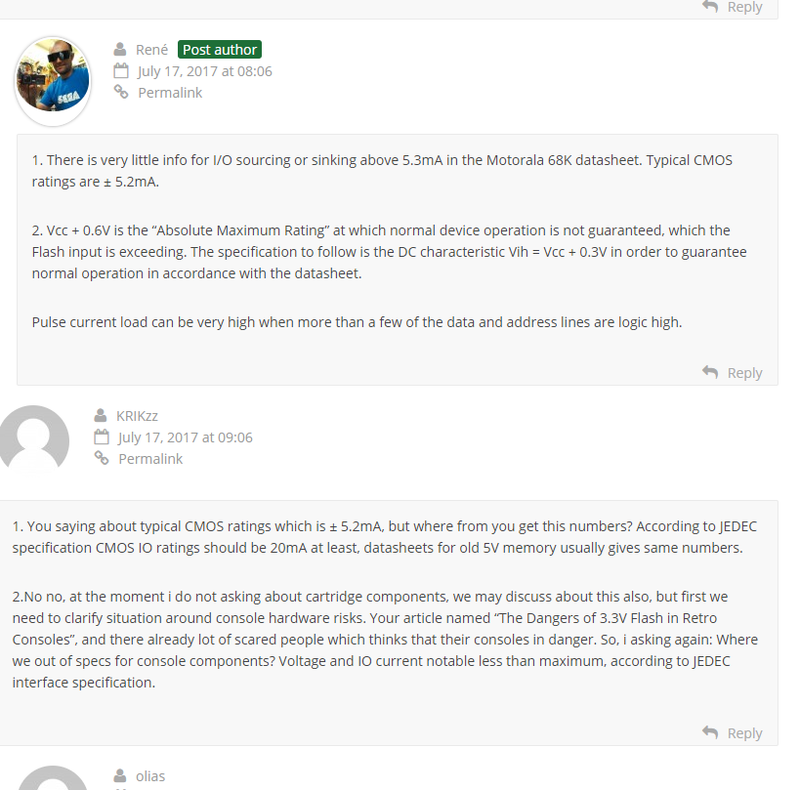 Off Topic / Few words about db-electronics article "Dangers of 3.3V Flash"
It now more than year after article were released but people stil asking me again and againd about this stuff, people still belive that flashcarts can burn their consoles. I seriously tired justify oneself, so i decide to make this topic and then just point here all who ask about this article. First of all i would say that almost all modern everdrives used voltage trnslators from 5v to 3.3v bus, the only carts which still use direct connection between 5v and 3.3v is mega-x7(partially), everdrive-gg and flaskit. So, modern everdrives does not have have any risks, even if db-electronics would right. Now i would like to say few words about Rene's article: It based on incorrect data and it makes most of his statments is false. 1. Rene used in his calculations 4 times less ratings than they actually are. He says: Typical CMOS ratings are ± 5.2mA. According to his own calculations IO loads on old everdrives around 7mA. But JEDEC specification cleary says that IO current limit for CMOS devices is 20mA and not 5.2, as Rene says. So, actually we do not out of specs, it means that whole article on Rene's blog lost the sense. When i point Rene on this facts, he just say nothing in reply. 3. 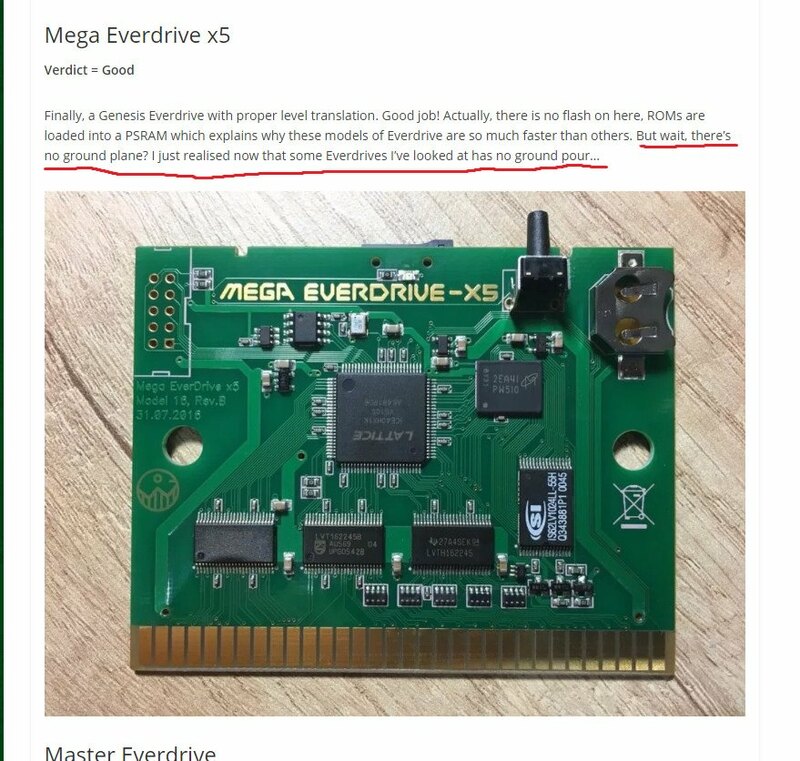 And now is example of outright lie from Rene: He claim that some everdrive does not have ground pour, and as exemple he shows mega-x5, but mega-x5 actually has solid pour on back side, and most of recent everdrives use 4-layers pcb with dedicated layers for power and ground. But when i pointed Rene on this facts, he just ignored me, he did not fixed his article, he knows that it is not true but leave all as is. New OS v20 contains a lot of new mappers, improvements and fixes, this is probably biggest update for N8. Woks over new release almost complete and i decide to publish beta build for tests. 1. Now save states supported by all mappers. 6. FDS autoswap blocking function. Hold select to prevent disk swap (until select pressed) This mostly for test fds sound in zelda intro. News / Joyzz Availalbe for order! .Power saving mode. Battery discharge time in this mode more than year. If there is no any activity for a few minutes controller switches to power saving mode, after pushing on start or d-pad buttons controller immediately will back to active state. 4. SMS controller mode: Hold for 3 sec. MODE+START+B. Required for some SMS games which is not compatible with genesis controllers. 6. Sync controller with receiver: Hold sync button on receiver for 4 sec until led on receiver will start blinking. Hold MODE+X+Y+Z until led went out. 1. Constant led shining: Controller is not connected. 1. Is there anyone who could make reference records of sound from real FDS? At the moment i working over large update for N8 and i hope that FDS sound finally will be fixed. 2. Also i wonder if some emulators has good enough sound emulation? 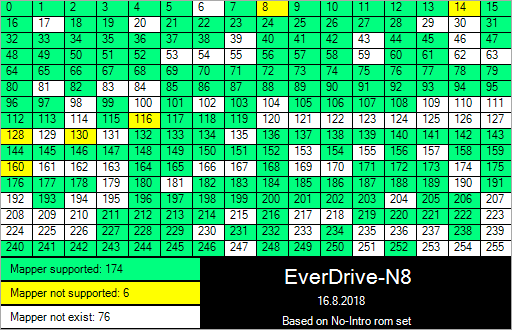 News / Master EverDrive X7 avaialble for order! This topic has been moved to Retro Marketplace. This release include full support for all games with eeprom saves. News / EverDrive-GB X series almost here! I just finished development works over new EDGB-X series, and we got all required components, so we ready to start production! Start of sales planned on begin of august. Information about pricing will be published bit later. New carts for classic game boy/gbc coming soon. All carts will use PSRAM instead of flash, components with much more effective power consumption compared to current everdrive-gb, some cool features and new OS. All of this will coming with new EverDrive-GB X series. Estimated release date is middle-end of summer. Price will be published right before release. Recently i disovered that some sellers offers N8 clones with OS13 preinstalled. I bought one to check what is going one. And what i see, they just mixed menu ROM file from OS v13 and mapper files from OS 9. Seems like this is next level of their impudence So, now menu shows V13, but by the fact this is just an buggy monster with functionality which stuck on the level of OS v9, but additionally now this have some extra problem due the mixing of files from different versions of OS. 2)"Reset to Game" option renamed to "Reset to Menu" It should be set to ON to back in menu after reset.